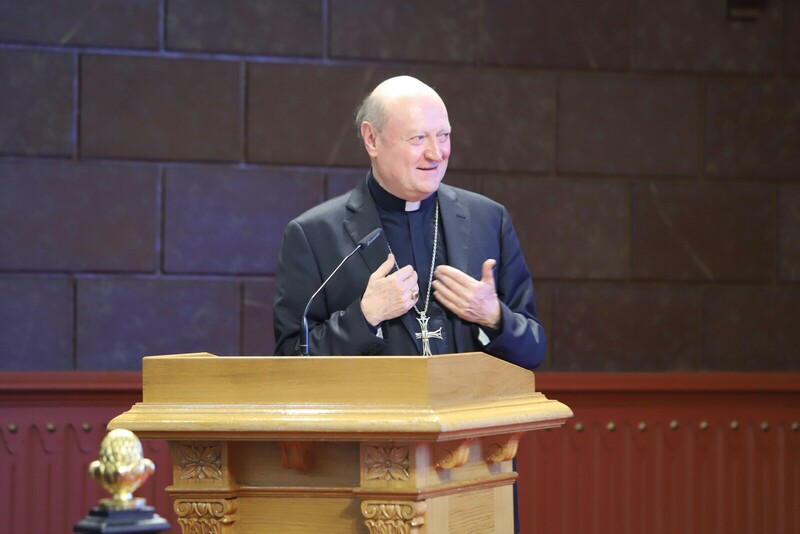 Cardinal Gianfranco Ravasi is, according to the Jesuit Secretary of Higher Education Michael Garantzini SJ, one of the “preeminent thinkers in the Church today”. In his lecture, he analyzed some of the major challenges that humankind faces in today’s world. He started by mentioning important socio-cultural characteristics such as multiculturalism (and a preferably dynamic concept of interculturality), the fragmented-self, technocracy, post-truth, secularism and its variants. He went on to focus on two cornerstones of the contemporaneous world: science and communication. The horizon of contemporary science raises new challenges for anthropology. Manipulation of DNA, neurocognitive sciences and artificial intelligence pose crucial questions concerning the meaning of being human, with important and “turbulent” consequences also from the philosophical-theological-ethical perspectives. We risk not understanding ourselves and being incapable of dialogue, becoming victims of a sick communication (violence, stereotypes, vulgarity, falsification, etc.). The exponential multiplication of information can lead to agnostic relativism, intellectual and moral anarchy, and to a weakening of the ability to be critically selective in interpretation. Hiding under the apparent “democratization” and “deregulation” of communication, we also find subtle operations of homologation and control. And last, virtual relationships can lead us to an era of “cold” and lonely communication that explodes into forms of exasperation and perversion. But in the face of all these trends, Ravasi warned us against pessimism. Realism and criticism do not justify isolation: “What is certainly not Christian is the disincarnated stance taken by those who close themselves into their little ancient world, satisfying themselves with the rules of the past, deprecating the degeneration of the present era”. The challenges are strong, risky and dangerous but “for this reason, they require trust and courage”, and awareness that “the heart of the faith is in revelation, or in the divine communication that breaks the ineffable silence of transcendence and opens to humanity”. He finished with an invitation to compose a new phenotype of “human nature” for which we can find valuable contributions in the personalist philosophy (Lévinas, Mounier, Ricoeur, Buber), centered on an absolute other and the dignity of the human person, as also does Biblical anthropology itself. A short but fruitful dialogue with some of the participants helped to underscore the importance of building that new human nature on the grounds of a model of justice and integral ecology.